The first time I made my Italian boyfriend a dish of pasta, he took one mouthful and looked at me. Horrified. Pasta without salt, way up the list of the seven deadly culinary sins as any Italian schoolchild already knows. Rule number one: add salt to the cooking water. Post-seduction, I learned to cook. And as I live in the area of Milan, Monza and Brianza, I learned to cook some of the dishes from this area. Italian cookery is very region-based – in this case Lombardy – and within these regions each area has its specialities. 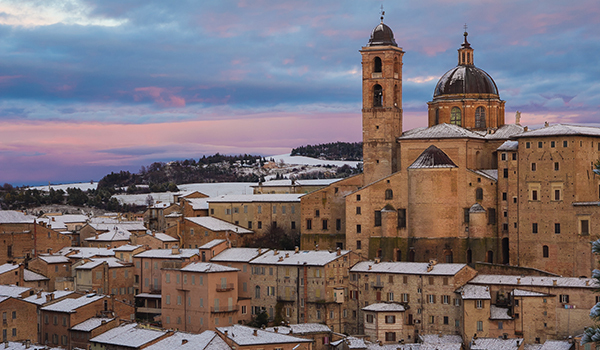 So if you’re living and cooking in Italy, chances are what you put on your plate will speak not just of Italy, but above all of the area in which you live. I learned to put salt in the cooking water for pasta. I learned that garlic isn’t used everywhere. I’d need to go south for that. Most importantly, I learned that recipes don’t need a long list of ingredients to be successful. Simple is best, but simple needs quality ingredients, so keep it seasonal. And remember, the ingredients should be the stars of the show, not the condiment. Twenty years after the salt incident, the Italian boyfriend is now my husband and I’m cooking for a family. I cook a lot of pasta, risotto and cotoletta alla milanese – veal sirloin fried in breadcrumbs – and in winter there’s polenta, stews and pizzoccheri. There are focaccine (little focaccia) for school snacks and various sandwiches stuffed with Parma ham, Tuscan ham (with memories of a camping holiday), salami and prosciutto cotto. There are also Sunday dinners, roast chickens, Yorkshire puddings and cupcakes. Food really is where cultures meet. Possibly the great favourite in our house is cotoletta alla milanese, also known as orecchio di elefante. Pane e cotoletta – without the bone and in a sandwich – is found in football stadiums, motorway cafés, street food vans and village festivals. It’s a fail-safe dish, often on a Friday night in front of the TV. To make the true cotoletta, you need a veal sirloin cutlet. Coat the cutlet in flour, followed by beaten egg and then in breadcrumbs (homemade please, not out of a packet). Repeat the last two stages if you want a more “crusty” cotoletta. Don’t forget to flatten it down to tenderize it beforehand, and make sure it’s properly coated. Cook it in butter as this will produce a richer taste than cooking in oil, and if you can get butter from a local farm, even better. Historically, butter has always been used in northern Italy. Even in more wealthy kitchens, cooks used what they found locally, and this was butter or lard. Central Italy and southwards was where you found the olive oil, although oil is produced in milder northern climates such as Liguria or the Lakes. 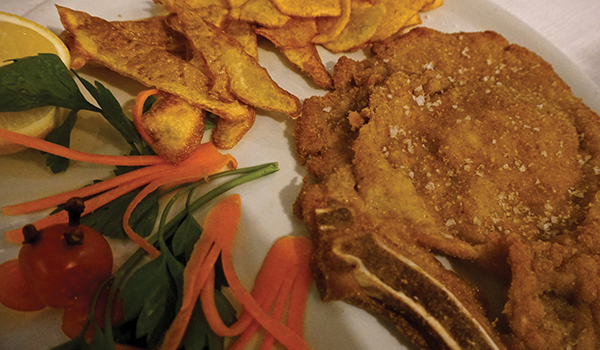 Nowadays, restaurants often serve cotoletta with a slice of lemon to squeeze over but at one time the butter and juices from cooking were poured over before serving. If you don’t wish to use veal, use pork chops, chicken or turkey. But don’t call it cotoletta alla milanese. It’s simply cotoletta. My mother-in-law does a version where she mixes finely chopped herbs, really what she has available at the time, with the breadcrumbs. Definitely worth trying, and proof that there are no set rules. Every family does it to their own preference and often with what they have to hand on that particular day. I learned that a risotto is not simply a risotto. 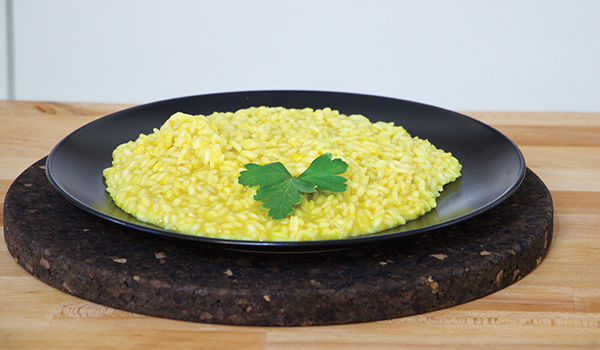 And if you’re living just north of Milan, then it will be risotto alla milanese or risotto giallo – yellow risotto – as it’s often called. It may seem easy enough to make but it’s deceptive. Each grain should be separate, the rice slightly al dente. To make a good risotto you need quality rice, just as to make good pasta you need quality pasta. Carnaroli is considered one of the best, as are Vialone Nano, Roma and Baldo. A good risotto also needs attention. This isn’t the time to go and make a phone call. Trust me, I’ve been there. If this does happen, just add extra broth, throw in some extra Parmesan for good measure and give the kids a spoon. Not very Italian, but the chances are they’ll eat it anyway. Risotto alla milanese should also be cooked in butter. Fry the onion in the butter first and always add a knob of butter at the end of cooking. This is called mantecare, making it creamy, suitable for a dish that’s associated with richness, and riches. A manuscript in the Trivulziana Library in Castello Sforzesco tells how, in 1574, an apprentice of master glassmaker Valerio di Fiandra used to add saffron to his paints to make the colours more vivid while they were working on a window of the cathedral in Milan. It earned him the nickname “Zafferano”, saffron. “You’ll end up putting saffron in your risotto,” Valerio laughed one day. And so “Zafferano” did, when he was cooking the risotto for Valerio’s daughter’s wedding celebrations. The guests loved it, and before long it was the new fashion throughout the city, not only for its flavour but for its golden colour and associations with wealth. After all, this was the city of Milan. You really should fry bone marrow with the onion to make it truly authentic, although on a daily basis you might not do this and a lot of recipes don’t include the bone marrow either. And while using a stock cube isn’t exactly a sin – all Italian home cooks use stock cubes for their risotto at some stage – you’ll notice a huge difference if you use fresh meat stock. Risotto alla milanese traditionally accompanies osso bucco, or oss büs in the Milanese dialect – veal shanks braised with wine and vegetables. Serve both of these together and you’ve got one of the most traditional and renowned Lombard dishes. Risotto ai funghi (use fresh autumnal porcini mushrooms if you can) and risotto alla monzese (Monza’s risotto) are also very popular in our house. 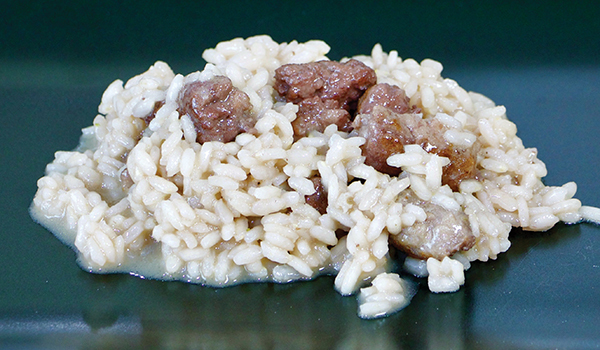 Risotto alla monzese uses luganega sausage meat, browned before you add the rice. My kids recently decided they like the sausage fried up as small sausages and added at the end. It’s no longer risotto alla monzese but still delicious. I’ve also eaten risotto alla milanese with a dense sausage stew on top and it’s now another family favourite. When you make risotto, make extra. Risotto al salto is leftover risotto formed into small balls or cakes, or one big cake, and fried. Or make arancini. The original Sicilian ones contain ragù, but you can use mozzarella, ham, or experiment according to taste. 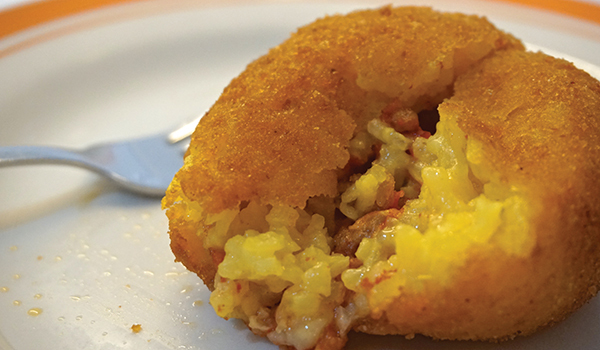 The arancini I remember most were ones I ate at a women’s refuge. They weren’t the best arancini I’ve eaten, but that wasn’t the point. They were made by a woman who had left her own kitchen, her old life, and was now learning to reclaim her life on her own terms, and she was also doing that through food, through familiar dishes that were part of her identity. It was a far cry from the traditional Italian mamma of the stereotypes, yet we all know stereotypes never tell the full story. And while the olive grove and the Italian mamma dishing out pasta under a Tuscan sun may be appealing, there are many other stories that tell an entirely different tale. Food offers far more than nutrition. The act of eating together, being a tavola – at the table – that is so central to Italian culture, can create harmony, and sometimes that harmony may be very much needed.